Who originally named the arch at Promontory The Chinamen's Arch? Richard Francaviglia discusses this in his book Over the Range, a History of the Promontory Summit Route of the Pacific Railroad (Logan: Utah State University Press, 2008). 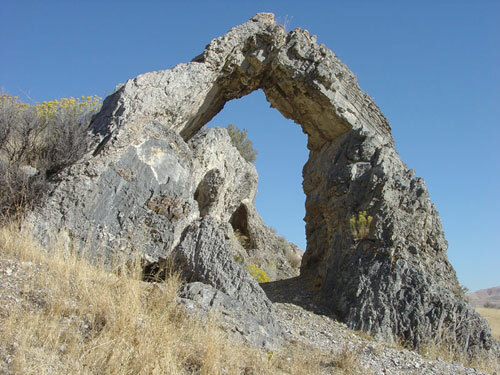 He found no reference to the rock formation or that name in period literature, but it was commonly referred to as Chinaman's Arch by the time of 1950's commemorative activities. The name was recently changed through the efforts of Francaviglia, members of the Asian-American community, and others from "Chinaman's Arch" to "Chinese Arch" in NPS literature The stories of graves at the site has not been confirmed, nor the tale of UP workers intentionally dynamiting/killing the CP's Chinese workers along the grade here. Possibly the tale of UP workers intentionally dynamiting/killing the CP's Chinese workers comes from the publication of a Harper's weekly engraving that could easily be misinterpreted this way on a different page from the text that gives the picture an entirely different meaning. "Jim Livingston, Sharp's able foreman, said nothing but went to work and loaded a point of rock with nitroglycerine, and without saying anything to the CP 'let her rip.' The explosion was terrific. The report was heard on the Dry Tortugas, and the foreman of the C P came down to confer with Mr. Livingston about the necessity of each party notifying the other when ready for the blast. The matter was speedily arranged to the satisfaction of both parties." Below are some of my very sloppy notes from the period newspapers nearest construction (the further you get from construction the tales get wilder, as you mentioned, the case of the "Harpers'" article. Not that they needed to exaggerate, plenty of violence along the line). The Chinese did work on the east side of the Promontory, but, again, no evidence of an effort by them or UP crews to blast each other off the grade. Telegraph April 1, 1869, Brigham City letter, two wounding in shooting at grade at Bear River. Telegraph, April 8, 1869, Hot Spring siding letter, Apr 5. Describes beautiful setting of Hot Springs and industry of Casements workers along line to distant Promontory. Here are box and flat cars, laden with miles of iron rails, tons of spikes, cords of ties and bolts, shiploads of square timber for bridges; also plank and lumber, mounds of corn, bacon, flour sugar, groceries and construction stores; besides untold quantities of scrapers, wheelbarrows, plows, points, shovels, picks, handles, steel bars for drills – everything, 'from a needle to an anchor,' including a very large and select supply of tin spoons." Photographer Covington and wife op restaurant here. UP bldg tele office here and water tank. UP and CP a few yards from each other, CP up slope. UP plans for towns have been frail affairs, as will be there effort near here. Water the key. Combat deepens between the rival rr cos. Gov Stanford of CP has injunction for UP work to cease on Promontory, while UP keeps going along; track to be at Bear River Monday. Telegraph, April 10, 1869, John Barry, shot at the Promontory, removed to Brigham City and had bullet removed by Dr Ormsby; recovering. Telegraph, April 13, 1869, Letter from Sharp & Young camp, Promontory, April 9, at Corinne is Casement’s boarding train and two fine locomotives at the end of track. Has switch and wye at Corinne. Desc town: "One house or tent of feminine frailty, one bar room and chop house adjoining, one grocery, one saloon with ‘convenient’ apartments, one toggery institution of Jewish origin, one keg saloon, …one hurdy gurdy," etc. As one approaches the Promontory "a marvelous view reveals new clusters of tents, hitherto obscured by some towering mass of grey rock … From this camp the beholder may delight in vision with the discovery of camps almost innumerable – above the grade, along the grade, remote from the ... blasting, carting, shoveling,wheeling, picking, etc. The busy carvers of the iron ways for the Union and Central Pacific are being pushed to the utmost endurance to be ready for the tracklayers rushing upon them now, at such proximity, from front and rear." On southeast base of Promontory is the hq of Benson, Farr, & West and those of Sharp & Young. One mile west upon an eminence in full view is that of Maj. L. S. Bent and L. Charmicael and Co., immediately above are their working camps covering a broad space of slope. Then, on the northward, are the camps of M. S. Hall, Hill & Green, Sharp & Young, Benson, Farr & West and Young & Snow. "These represent the working force upon the almost super human task of making a railroad grade across the Promontory – all told, U.P. and C. P. probably not less than six thousand men. Sharp & Young on UP with 200 men work day and night on 8 hour shifts blasting. Farr & West run blasting crews day and night, so are all the contractors on the grade. Chinese tracklayers are at Cedar or Promontory City, about 12 miles west; CP nearest to completion here on Promontory. On Tuesday night two men were killed at Deadfall or Harrisonville, two miles from here. At Junction City, “Lucky Bill” shot John Berry through the arm: Berry then shot his assailant in the abdomen and he died yesterday. Telegraph, April 14, 1869, impressive work on the Promontory is the massive CP fill on Farr & West’s contract, along 500 feet and 170 feet deep has 250 teams and 500 men working last two months. Many workers from Cache county. Wm Fisher and Wm Lewis are supervisors, replacing Bishop Merrill. Thirty foot cuts being blasted on each side – three mules killed in recent blast accident. James C Livingston genl overseer of this massive rock work, formerly at Weber Canyon, and well known for his champion law and order; runs strict camp. Nearby is trestle work being built by Hall & Casement for UP. The two lines and their cuts wind their way up the rocky slope a few feet apart. Telegraph, April 15, 1869, UP grade to Monument Point, except on Promontory done; CP has removed subcontractors from grade – "not satisfied" – and placed a "swarm of celestials" at work. Paid $35 per month and board themselves. Telegraph, April April 29, 1869, Bear River siding letter Apr 24. teamster returning from Promontory shot near lookout mtn by would-be horse and wagon thieves. Three men killed in row at Deadfall, two miles west of Junction City. One of them was an officer of the "Mining" election there recently. Two other men killed and murdered near sand-ridge on Hooper’s old grazing grounds. One of Carmichaels crew went into the cook tent late at night and cut his throat – under Dr.s care; is deranged. With a few days delay at Blue Creek and the mammoth bridge on this slope of the Promontory, the UP will be done. Maj Willcox marched his troops, 4 companies, from Corinne to the end of the CP bound West. Telegraph May 20, 1869, news from the Promontory is that all the roughs have left and that nothing sensational is transpiring except a little horse and cattle stealing. ReporterMarch 26, 1869, Corinne letter, March 23. April 9, 1869 Ed Conway visited – has office and wires of Western Union at Corinne up and ready for him to operate. April 10, 1869 Report that pres of CP has injunction served on UP at Promontory to not deposit material within 200 feet of CP grade. Deseret News April 14, 1869, end of track at Bear River, cross bridge and will make short time to Promontory. "at a rate of speed not heretofore heard of in the history of track-laying." Deseret news, April 7, 1869, Promontory, near Cedar City, letter, March 25. "Junction City, twenty one miles from Corinne is the largest and most lively of any of the new towns in this vicinity. Built in the valley near where the line s commence the ascent of the Promontory, it is nearly surrounded by grading camps, Benson, Farr and West’s head quarters a mile or two south west. The heaviest work on the Promontory is within a few miles of the head-quarters." Sharp & Young’s blasters. [see Kraus], blasting accidents. 300 whiskey shops between here and Brigham City., Biggest contractor is Red Jacket [whiskey]. May 5, 1869, daily, letter from RR line, Ap 27., heavy bets here where CP plans to build ten miles of track, near Cedar. Expect 10-20,000 to change hands. CP track is smooth and CP engineers run 30-35 mph. Fixed speed when line set in motion will be 40 mph. Gov Stanford was at Corinne and could give no assurances that CP would patronize the UP town. During conversation with Eastern traveler there had to concur with his remark: "God Almighty have mercy on the people of Ogden, if the carcass of Corinne is to be disemboweled in their streets." Rode with engr Murphy 18 miles down line from Bear River in new UP engine at 40 mph., or 25 minutes., felt like running like lightening. Dillon, Reed, Hoxie, Seymour and others on line, Ogden-Promontory making assessment prior to sale to CP. Track in Weber still wavy with the thaw. The striking tunnel builders returned 4 or 5 days ago after three weeks and set off last blast in tunnel 3. Howe bridges from Chicago replacing temporary ones. Big construction depot at Echo coming to the end of its days. Mr. Goseline doing inventory for co. Big fill to go in here to be done by Carmichael and Hill & Green since Warner & Whitman relinquished contract. May 5, 1869, letter from Office JS & DF Casement, end of track, April 23, News of Cong decision has decided effect here. CP crews on eastern base of Promontory have "ceased work." And UP work on grade being pushed with all speed. "Thus has terminated the grand railroad contest." UP construction of 500 miles in year is phenomenal, while Capt Clayton that his track-layers only working half the 12 months because of lack of rail. Praise to engineer crew led by Reed, the engineers North, Bissel, Smith, Seymour, Morris, Truesdale, Gillis, Bratton, Burgess, and Sharman. Casement best of their business in the world, having blt rrs for 17 years in Ohio, and here. Tracklayers: first twenty men with picks, shovels, road-gauges, pounders, spike mauls, etc work in pairs in preparing grade for very 14 foot rail. Then “head-spikers” who drive six spikes in each rail, followed by crews that add fish plates and additional spikes. Head spikers proceeded by crew laying out spikes on ties. Next come track liners who with bar get track in shape. These are aided by water carriers, back-iron men moving rail on cars, lad that picks up lost spikes, etc, and don’t forget “Champion Tom,” the horse pulling the cart of iron to the men, been with the crew since Omaha. Describes boarding train in detail., attended by engines 117, 119., Sam Bradford engineer of latter. Twenty miles to go. Gov Stanford gives no assurance on jct question. Editor fears for Ogden if Corinne’s riff raff sent there. Reporter, April 29, 1869 Party of Col Buel arrived from CP traveling overland to catch rr. And off for England.—transcont travel underway. —a laborer from camp of Green & Hill entered the saloon of Jim Bristner at Dead Fall in a fight when B shot him; B went ¼ mile to G&H camp and workers enraged chased Bristner and shot him. Another shooting at Painted Post and Gerty Mike killed; no details. Reporter, May 11, 69 Last spike driven yesterday noon. Details tomorrow Large number of workers were in town Sunday from Painted Post, Hell’s Half Acre, and Blue Run, with the result of several private knock downs. Monday morning Casement’s workers broke into fight at depot and would have gotten bigger except train whistle blew to take workers east. May 13, 1869 Corinne has garroters at work on its streets. Example of one Richards, paid off railroad worker, hit with club and robbed. Casement sells 150 head and 50 wagons. May 18, 69 Before leaving the Promontory Carmichaels given gold watches by employees. May 20, 69 three garroters caught – a ring. Leader, May 11, 1869 --200-300 of Casements veteran workmen passed through on morning train headed home in the East. May 13, 1869, special train with another 400 of Casements workers av from end of line and went east this afternoon. 300 laborers were paid at banking house of Wilson & Morton here, Corinne – times lively. Some lost their every cent at the gaming tables. Thanks for the wonderfully detailed accounts of the construction in Utah!